When a young entrepreneur came to Sarriera + Weinstock with a project in Barcelona, the team knew they had their work cut out for them. 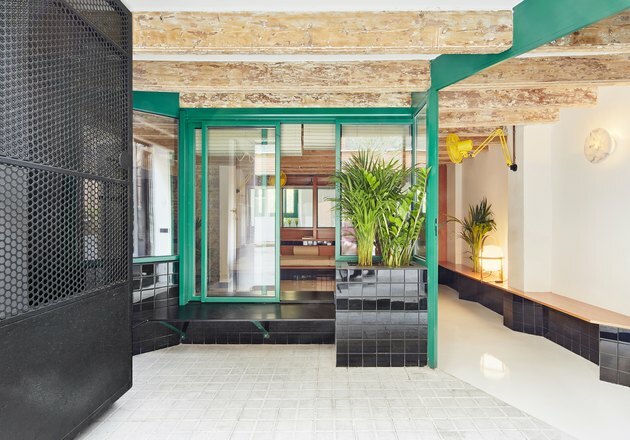 The owner presented a space that was once a motorcycle repair shop, with low ceilings and a noisy bar for a neighbor. And he asked for it to be converted into an inspiring, but quiet, studio. 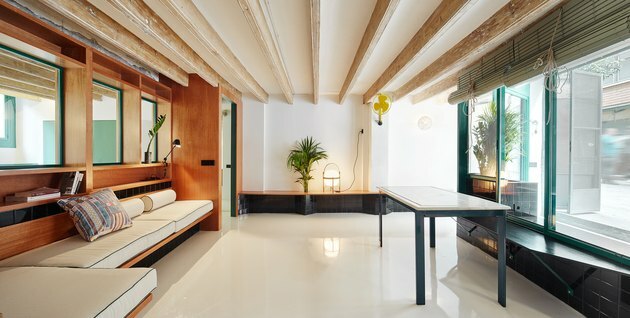 The firm's architects, Mariana de Delás and Marcos Duffo, were up for the challenge — all it took was a little reconfiguring. First, they put private rooms at the back of the layout and created a front garden to muffle noise from the street. Then, the pair installed front doors and windows that efficiently opened up and out, and they covered the walls and floors in white to make everything feel larger. Lastly, to really make the studio feel fresh, they picked a jewel-toned green accent paint to pop against the minimal details. The result is a hideaway that's perfect for work and rest, proving that even the trickiest architectural elements can inspire great solutions. The space sits on a busy avenue, and a built-in metal and tile bench acts as front row seating to the passersby. However, building a buffer for privacy was essential. de Delás and Duffo came up with the combination of an iron front door and sliding windows to shut out noise. The front room — which includes the living area, dining room, kitchen, and work space — opens up onto a small street garden. Sarriera + Weinstock designed the yellow wall fan and the textiles used throughout. The team found that when people entered the original location, their immediate reaction was to duck because of how low the ceilings felt. To make the space seem bigger and brighter, the team chose a white epoxy resin flooring with extra gloss. The shine and neutral color counteracts the perception of a low ceiling. The strategically-placed bedroom is at the back of the studio, away from the noise of the street. 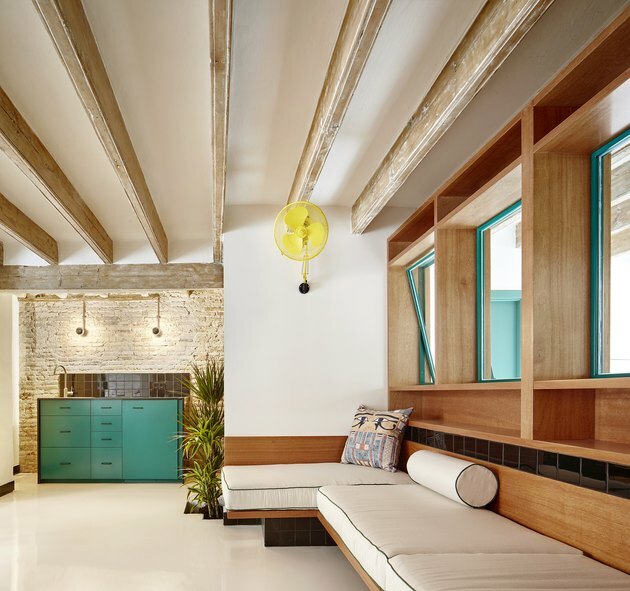 Built-in furniture, like the bed and benches, optimizes the small space. 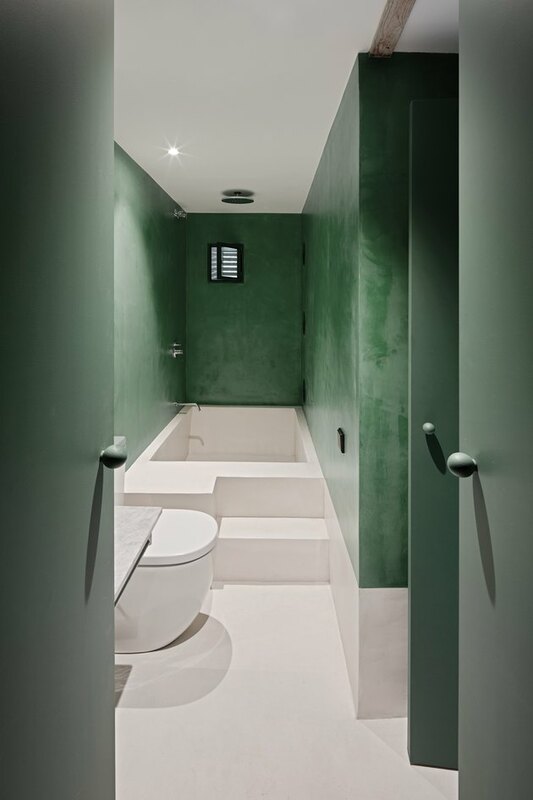 The emerald-colored paint is a custom shade from Jallut Pinturas, a industrial paint company based in Barcelona. The flooring extends into the built-in bathtub to create a clean line.